My name is Amelia Gray. I'm a cemetery restorer who sees ghosts. In order to protect myself from the parasitic nature of the dead. I've always held fast to these rules passed down from my father . . . until now. Detective John Devlin needs my help to find a killer, but he is haunted by ghosts who shadow his every move. To warn him would be to invite them into my life. I've vowed to keep my distance. but the pull of magnetism grows ever stronger even as the headstone symbols lead me closer to truth and to the gossamer veil that separates this world from the next. Amelia Gray is a cemetery restorer and an expert at her job, with a lot of time and patience she is able to restore even the most run down graveyards and bring them back to their former glory. Amelia also has a secret though - she can see ghosts. To avoid unwanted attention from the ghosts she has a set of rules that she lives by, first and foremost is to never, ever acknowledge a ghost but also high on the list is to avoid anyone who is being haunted. That makes things rather difficult when Detective John Devlin, who is haunted by the ghosts of a woman and child, asks her to help him track down a brutal murderer. The bodies are being left in a cemetery that Amelia has been employed to restore and he believes that she may be able to find clues in the symbols around them. Amelia is reluctant to get involved but how can she refuse when a killer is on the loose? Amelia is a solitary character, her ability hasn't made it easy for her to have a normal life and she spends much of her time alone. It's a fairly lonely life but she doesn't sit around feeling sorry for herself and instead immerses herself in her work and in her blog. She has very strict rules that she knows she must live by if she doesn't want the ghosts to pay any attention to her. These aren't your harmless ghosts who just float around looking scary - they are actually more like parasites and will latch on to people to siphon off their life energy so it is very important not to be noticed by them. When Devlin appears on the scene she is immediately drawn to him but she knows she should avoid him and the two ghosts who are never far away from him. In fact her life could depend on keeping away from him but that is easier than it seems when she is drawn deeper and deeper into the murder investigation. Devlin is an interesting hero to the story, he is very secretive and we only learn a limited amount about what happened in his past so I don't feel like I know him well enough to be attracted to him. However, I do find him intriguing and am curious to find out more about him as the series continues. I'm glad that the story wasn't overtaken by romance, there are plenty of hints at a possible future entanglement between Amelia and Devlin and at one point I was sure things were going to get serious already but we have been left hanging which I have to admit is something I liked. I love a bit of will they / won't they potential in my urban fantasy series! 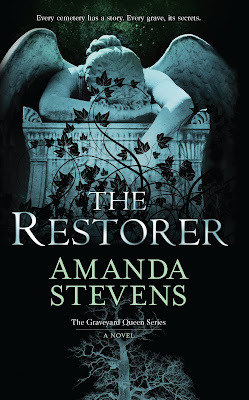 The Restorer is both a murder mystery and a chilling ghost story and the graveyard setting just adds to the creepy gothic atmosphere. I loved Amanda Stevens writing style, her descriptions are fantastic and I was able to picture the graveyard and headstones perfectly. She has obviously done her research and I found the information about symbols used around cemeteries was fascinating. We are left with a lot of unanswered questions but this was still a fantastic start to the Graveyard Queen series and I can't wait to read the next book! I really love this series, It's always so interesting and amazing! I can't wait for the next one.